University president Jim Gaertner recognizes this year's Faculty Excllence Award winners, who include Joyce McCauley, Excellence in Service; Sam Souryal, Exellence in Teaching; and Marcus Boccaccini, Excellence in Research. 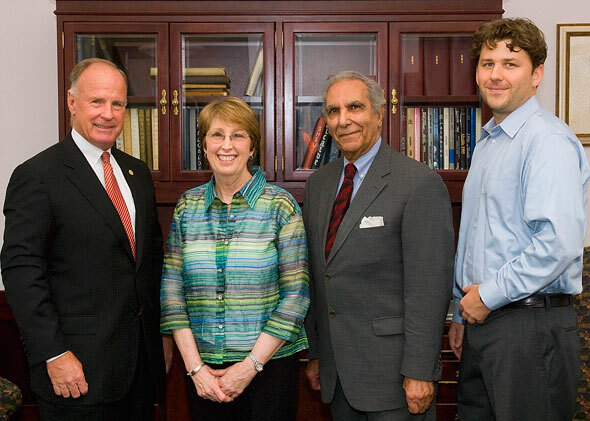 Souryal has also become SHSU's third faculty member to receive all three awards. A professor who encourages as much research in the classroom as he participates in outside of the classroom, one who serves as a “model” for service, and another who has distinguished himself in the classroom have been named the 2009 Faculty Excellence Award winners. Awarded a $5,000 prize each are Marcus Boccaccini, Excellence in Research recipient; Joyce McCauley, Excellence in Service Recipient; and Sam Souryal, Excellence in Teaching recipient. With more than 120 peer-reviewed publications and presentations under his belt, assistant professor of psychology Marcus Boccaccini has received “substantial attention” for his recent line of research that explores adversarial allegiance in forensic evaluation, or “the pull for forensic evaluators to reach opinions that support the party who retained them,” according to a nomination letter. He is the Excellence in Research award recipient. Boccaccini has also distinguished himself as a collaborator in the psychology department, formally chairing projects and facilitating student publications at a “remarkable rate,” with more than 20 peer-reviewed publications co-authored by SHSU students and 50 peer-reviewed presentations with students since he began teaching at SHSU in August 2003. Boccaccini’s strengths as a researcher overlap with one of his greatest strengths: exceptional mentoring to students, according to a letter. “Although Dr. Boccaccini’s publication productivity is remarkable by any measure, it is important to emphasize that his publication record reflects a remarkable degree of generosity towards students in terms of time, input and authorship status,” another nomination letter said. “Students recognize his generosity, as well as his keen intellect. Not only do they seek to work with him, but they are fond of him on a personal level. One of SHSU’s “finest recruiters,” Joyce McCauley is the Excellence in Service recipient. McCauley, who has taught at SHSU since 1994 in the language, literacy and special populations department, serves as a model for both students and her colleagues, spearheading the university’s American Democracy Project. “She took the leadership of this project, which over the past five years has led dozens of service projects ranging from student voter registration to constitutional forum to discussions about service to placing students in community service activities to promoting service throughout the freshman leadership communities in these activities,” said one nomination letter. “She has been a tireless advocate of and participant in service at the university, in the community, and in the nation. McCauley also incorporates service learning in her classroom, creating and managing the Full Circle Literacy Project, which matches SHSU students in her block class with elderly residents of a retirement community in various literacy projects; and has spearheaded efforts to have students tutor senior citizens on computer skills. In addition, she has secured grant funding for a number of service-related activities, including a Campus Compact Grant that brought a Volunteers in Service to America to campus to help with the ADP, as well as various funding for her senior tutors for first grade struggling readers program and Sages and Scribes, a high school writing program. Sam Souryal, criminal justice professor who has already distinguished himself with the research and service awards, has become the third SHSU faculty member to win all three “excellence” awards with his receiving the Excellence in Teaching award. Souryal has been a professor at SHSU since 1973, teaching on the undergraduate, graduate and doctoral levels in such areas as police systems and practices, ethics of criminal justice, management and behavioral methodology, philosophy of justice systems and public administration and organization. He was selected as the Excellence in Research award recipient in 1990 and the Excellence in Service award recipient in 2003.